PMI Model No. 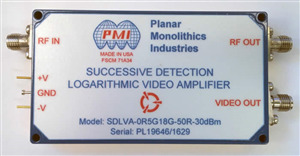 SDLVA-0R5G18G-50R-30DBM is an SDLVA (Successive Detection Log Video Amplifier) designed to operate over the 0.5 to 18.0 GHz frequency range. This model is designed for ultra high speed applications while maintaining flatness and accuracy.